In addition to the main story on the print, there are short scripts for several scenes scattered outside the hut where the man tries takes refuge in a futon while the women go at it. man between two women reflects the graph 嫐 (uwanari) -- which appears in the story and means, as it shows, a man (男) between two women (女). 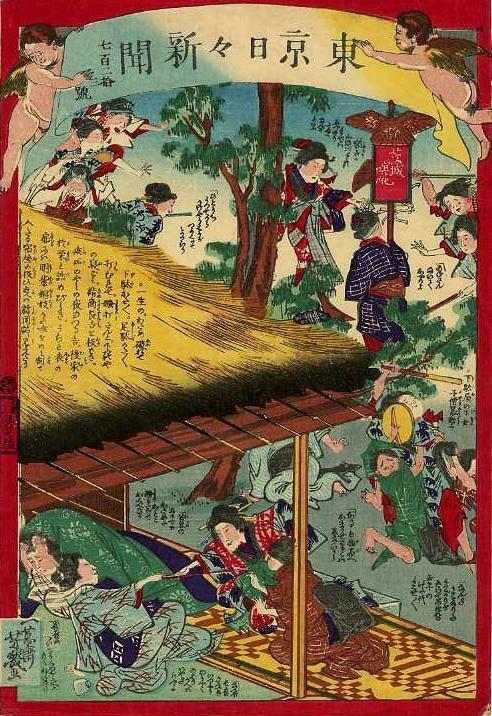 The red sign in the picture says "Ibaraki fight" (Ibaraki kenka), and in the brown wings above the sign are three playful representations of this character. news magazines is literally 新聞誌 (shinbunshi), as the first newspapers were called because their pages were folded and bound with paper strings. The word is somewhat quaint, as by then most news publications were printed newsheets called 新聞紙 (shinbunshi) -- a homophone meaning literally "newspapers".